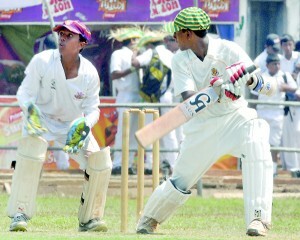 scoring affair, and raised the quality of the track at Moratuwa which was helpful to spinners. At close of play the Cambrians, regaining their lost form from first innings were 135 for the loss of five wickets with skipper Kusal Mendis making the top score of 42. With a certain draw looming the Prince of Wales’ batsmen may have thought the opportunity was ripe for the Limited Overs encounter which will be played today at the same venue. However Suchira Fernando (35) and Hasitha Lanka (21) who were inefficient as top order batsmen found their lost form while Ashen Mendis hit 23 following his good form in the first innings. Spinners Anushka Perera and Pramesh Fernando took two wickets each. Earlier on the day, resuming from their overnight score of 4 for no loss, St. Sebastian’s made a steady start but was later rattled by the paring of leg spinners Thilan Nimesh and Devaka Dabare. Following Avishka Fernando’s entertaining 49, Sangeeth Cooray emerged as the most successful batsman to hit 40 with the next best figure coming from skipper Anushka Perera, who made 19. Nimesh claimed four wickets and Dabare picked three following brief stoppages for rain. On the first day St. Sebastian’s won the toss and invited Prince of Wales’ to bat first. But play was restricted to 55 overs as the Cambrians were shot out for 162 runs. Cambrian skipper Mendis top scored with 48, followed by useful knocks from Shanuka Dulaj (31) and Ashen Mendis (30). Fast bowler Anuk Fernando picked four wickets while off-spinner Sangeeth Cooray picked three scalps.